With 41% of UK shoppers reconsidering a purchase due to queuing times, inadequate queuing strategies are leading to disappointing customer experiences and abandoned purchases, new research by Box Technologies and Intel indicates. According to the How Long Does It Take To Lose Your Customer report, the average Brit now spends one year, two weeks and a day of their lives stuck in shop queues. Today, UK shoppers deem nine minutes long enough to make them reconsider a purchase and are put off by queues more than seven people deep. With 86% of Brits saying they avoid stores if they perceive the queue to be too long, eight out of 10 (83%) shoppers deem fast moving queues as an essential part of the customer experience. However, three quarters (76%) say stores should be doing more to reduce queues in busy periods. Despite innovations, such as self-service tills and fast track self-scanning devices, supermarkets were deemed to have the most work to do in terms of tackling queues, followed by fashion outlets and DIY stores. 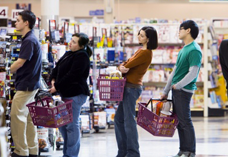 And, it seems it’s not just shopper frustration that is exacerbated by lengthy, slow-moving queues, it can affect brand loyalty; 74% would shop in a competitor’s store if they perceive the queue time to be quicker, while 70% would be less likely to return to shop again if they had experienced long waits, researchers found. Outlining how retailers can cut queue times while improving the customer experience, the report suggests enabling staff to become more mobile, stepping out from behind the traditional till counter to queue bust. Techniques, such as taking customer payments on tablets, not only diffuses the build-up of those waiting in line, but also provides a platform for clientelling, opening up both cross-selling and up-selling opportunities combined with more personalised experiences. As well as highlighting the importance of technology in reducing queue times, the shoppers polled as part of the research identified other ways in which retailers might improve the customer experience during peak periods. Nearly a quarter (24%) said retailers should offer extra loyalty points for those enduring long queues, while 21% felt rewarding customers with additional promotions, such as a free cup of coffee while the queue dies down, would improve experiences in store. One in 10 even thought a fast track queue for VIP customers might improve customer experience during busy trading periods.